So, I guess I’m not being passé or irrelevant if I voice my opinion again about the Tea Party. Here’s my essential problem with the Tea Party movement: I don’t want people in government who despise government and who are more interested in their rhetoric than they are in pursuing the truth. Polls don’t reveal everything but they can give us a general overview of what people are thinking and a recent CNN poll revealed that a very small percentage of Tea Party attendees knew that taxes have not increased under Obama. Admittedly, most people, myself included, did not feel a substantial break, but there were some like the Make Work Pay act. 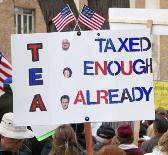 Tea Partiers polled didn’t realize that the tax raises that may occur are to taxable earnings over $250,000 a year (which comprises, perhaps, 2% of those protesting). I understand protesting taxes and I understand where value added tax talk and sales taxes levied on various items have people concerned; it is every bit as relevant to their pocketbooks, but the arguments from the Tea Party are broad strokes with buzz words like “socialism” that evoke an irrational frenzy that obscures the truth. I have a theory that traditional news sources (by that I mean non-Fox News) are so afraid of being labeled “liberal” that they fail to be responsible in providing a full array of information. 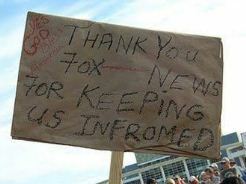 I can’t get the sight of a placard at a Tea Party that read “Thank you Fox News for keeping us INFROMED (sic)” out of my head. 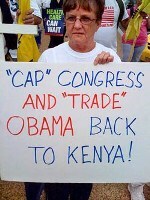 Very few TP’ers (are they still called “Tea Baggers”?) seem to realize that it was President Bush who put into motion the Emergency Economic Stabilization Act (2008) to the tune of 700 billion dollars. The initial bailout of Detroit and TARP and the “Too Big to Fail” bailouts of the banks took place before Obama became president, but the partisan yapping continues. Earlier this year, “Tea Party favorite,” Michelle Bachman got up at the rally in Washington and called the Obama Administration “Gangster Government.” Fine. She’s entitled to protest, but its disingenous since she never criticized a previous Executive Branch for trumping up evidence to justify a war and who then literally used gangster politics (cronyism) to allow massive no bid contracts that fed off our tax dollars. Or is it now off limits to give any responsibility to the Bush Administration? That’s now just whining, right? We need to get past double standards, inaccurate information, lies, ignorance, bias, history bending, false analysis and realize that solutions to economic crisis and social justice are not about “winning” or “defeating” the opposition with different ideas. Rather our mutual goal must be look deeper, gather as much information as we can, so as to find common ground and work together within the framework of our brilliant Constitution. 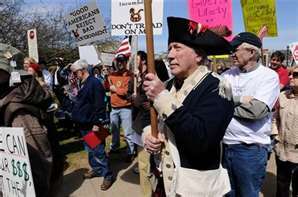 The Tea Party is throwing people out of office for using the very concept our Founding Fathers created. Their culture is to revile bi-partisanship and while they use the disguise of our revolutionary heritage to make their point, they are not living up to the principles the Colonial protest embodied- to be inFROMED. Previous Post - Previous post: Bruce Braley for Congress! You must be <a href="http://garyhasissues.com/wp-login.php?redirect_to=http%3A%2F%2Fgaryhasissues.com%2F2012%2F05%2Ftea-anyone%2F">logged in</a> to post a comment.